My green tomatoes picked after the Thanksgiving foliage killing frost. I recently wrote the following answer for my Dallas Morning News column. The question was: My tomato plants still have many green tomatoes. It’s November. Will they ripen? M. H., Flower Mound. Dirt Doctor Answer: Briefly put, green tomatoes can be stored, wrapped in paper or stored in the dark in boxes. Those that have ripened to a point will turn red and fully ripen. Those that still have seed that can be cut thru will not ripen. They can only be used in relish and as fried green tomatoes - which are great by the way. Several people challenged me and I thought you would enjoy some of their advice. June from Dallas, Texas: Your answer was not right. In fact, last year I picked 50 green tomatoes from my vine, wrapped them individually in newspaper, placed them in two boxes with a banana in each box, and after a month, some tomatoes were ripe and within two months, all were ripe. The gas given by the banana aided in the process – my Dad shared this with me many years ago. John from Garland, Texas: Every year I pick my late tomatoes green prior to the first freeze and set them on the kitchen counter to ripen. It takes time, but they ripen and are just great. Last year I picked 150 tomatoes off 6 plants. 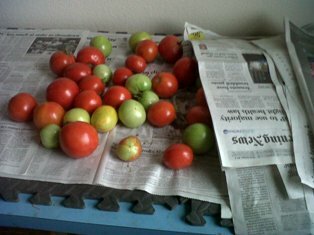 Yesterday I picked 55 tomatoes and will enjoy them as they ripen into January. 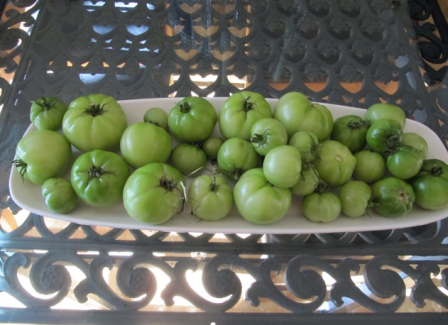 Lauren from Oklahoma: My grandmother was convinced that the paper/dark method allowed the green ones to ripen slower, keeping them like garden fresh tomatoes well into the winter. Her southern Arkansas tomatoes were mighty awesome and we always had them at Christmas. Jake from Dallas, Texas: I read your column and disagree with the green tomato answer. These were picked 3 weeks ago. I put them on newspaper on the workbench in the garage and covered them with another layer. Dotty from Paris, Texas: Pick every tomato prior to freeze, put them in bedding plant trays, and elevate the trays so they are not touching. Place so you can see them, for example on a dining room table - anywhere you want so they have a light source. They do not need to be kept in the dark. Tomatoes can be touching each other in the trays. Too much trouble to wrap, they just need a light source. Maggie from Fort Worth, Texas: A canning rule of thumb is to get the tomatoes in before frost hits the leaves. I do not put my tomatoes in the dark. Paul from Chino Valley, Arizona: We had our first freeze at the end of October and a lot of people had green tomatoes left. Emeril Lagasse has a great recipe for spicy green tomato soup. My wife made the soup and it is good. Placing them on a sunny window sill. This is a hit or miss solution. You’ll have much better luck ripening mature green tomatoes. Although the tomatoes are more stable sitting on their stem side, they will rot less readily if you can place them blossom side down. Wrapping individual green tomatoes in newspaper and layering in a box, no more than 2 layers deep. Place the box in a dark, dry spot and check weekly for progress. It usually takes 3-4 weeks for the green tomatoes to ripen, but check frequently and remove any fruits that show signs of rotting. Placing the green tomatoes in a paper bag with a ripe apple. The apple gives off ethylene gas, which speeds up ripening. Check the bag daily. The debate rages on. I encourage any and all comments and inputs. And finally, you can always eat your green tomatoes. Click here for tasty and delicious recipes.